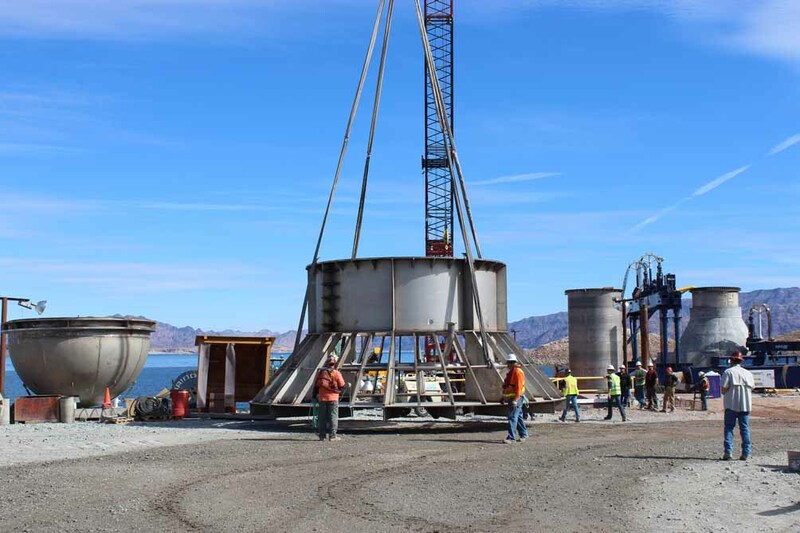 This week, Las Vegas Tunnel Constructors (VTC) – a joint venture of Impregilo and SA Healy – is gearing up to push out and lower the intake structure for Southern Nevada Water Authority’s third raw water intake tunnel at Lake Mead. The project’s 100ft (30.5m) high intake structure consists of a 32ft (9.7m) diameter reinforced concrete base with a stainless steel upper. The intake has been constructed on a docking barge that includes a moon pool (wet porch) and strand jacks to hold the intake structure over the moon pool. Production underwater blasting 350ft (105m) below the surface of the lake has been ongoing since 2010 to clear a platform for the placement of the intake structure, requiring 42,300 cubic yards rock and overburden material to be removed from the lake bottom. Sonar and ROV operations enabled crews to identify the lake bottom topography, measure excavation progress and guide the placement of the overburden and rock removal equipment. 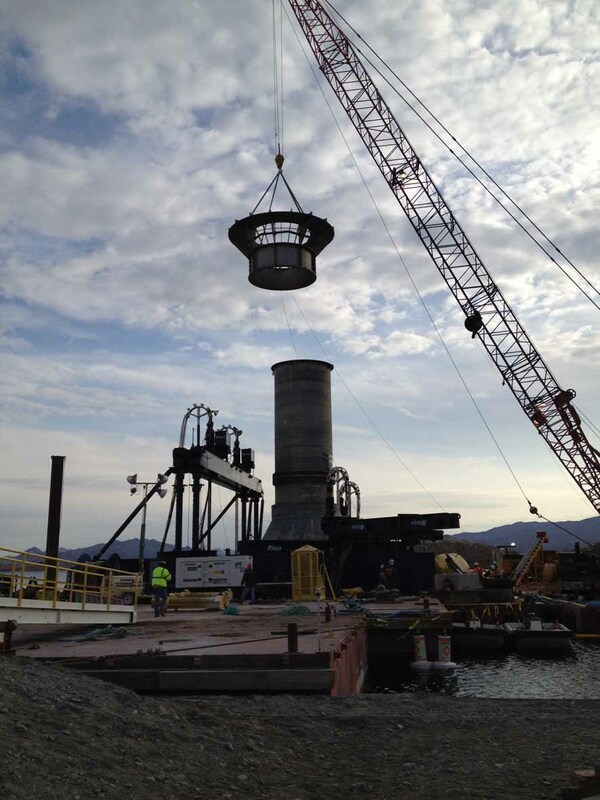 A crane on the crane barge has completed the intake structure assemtly and tugboats will now push the docking barge to the intake site out on Lake Mead. A cabling system will help lower the intake structure into place on the bottom of the lake. This will be followed by a six-day continuous tremie concrete pour to place approximately 12,000 cubic yards of concrete around the structure. The project’s 23.5ft (7.2m) diameter Herrenknecht Mixshield TBM will ultimately enter this intake structure via a reception chamber, about 27.5ft (8.4m) from the center of the intake structure, which will be covered with a soft eye that has used fibreglass rebar in the place of traditional steel rebar. Following the TBM’s launch in early December, it has now completed 55 rings or 312ft (95m) and at the time of going to press was undergoing a scheduled stoppage while the last of the machine’s 15 gantries are lowered and fitted into position. During this period, probe drilling and geological exploration works are also underway, prior to restart of the TBM before the end of February when the machine will resume its 15,420ft (4.7km) journey to the intake structure. The tunnel is being lined with pre-cast concrete rings formed of five 6ft (1.8m) long steel rebar reinforced segments + a key segment. This lining has been procured under a VTC materials purchase order from Precast Management and was fabricated off-site at a facility located about 10 miles south of Las Vegas. VTC’s $447-million design-build contract was awarded in March 2008. 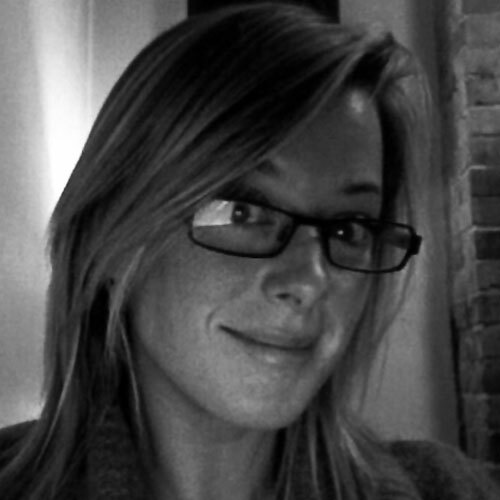 Lead designer for the JV is Arup, supported by Brierley Associates. The total current cost estimate for the entire Lake Mead Intake No 3 scheme, which encompasses three other key construction contracts, as well as planning, design, construction management, contingencies and administration is approximately $750M. The project is being driven by the worst drought to hit the Colorado Basin in recorded history. Lake levels have dropped significantly since 1999 and continued drought conditions could cause Lake Mead to below the existing Intake No 1, which currently delivers a large share of Las Vegas’ water supply.